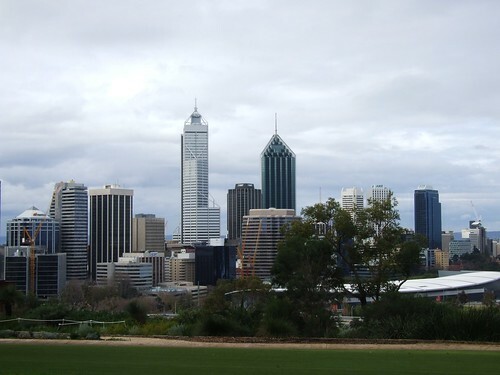 Photo I took of the Perth skyline a few months ago. The dark building with what looks like a pyramid on top is the headquarters of BankWest. The chief executive of the Commonwealth Bank, Ralph Norris, has confirmed that the rollout of BankWest branches on the east coast will stop as a result of the $2 billion takeover. Mr Norris has described BankWest as a leader in the growing Western Australian market and a good investment for CBA shareholders. Mr Norris says there will be no closures of both Commonwealth or BankWest branches and businesses in Western Australia as a result of the acquisition. Last year, BankWest launched a program to open 160 branches nationwide, but today Mr Norris said he will review BankWest operations in the east. “I would suggest that the branch rollout would cease,” he said. Mr Norris says a merged BankWest-CBA will be bigger than the Westpac-St George entity. Aha! This is just a tactic so you can keep calling yourselves number 1 after Westpac buys St George and BankSA! You shrewd, shrewd bankers ;-).